Second round of our Christmas canapé competition! 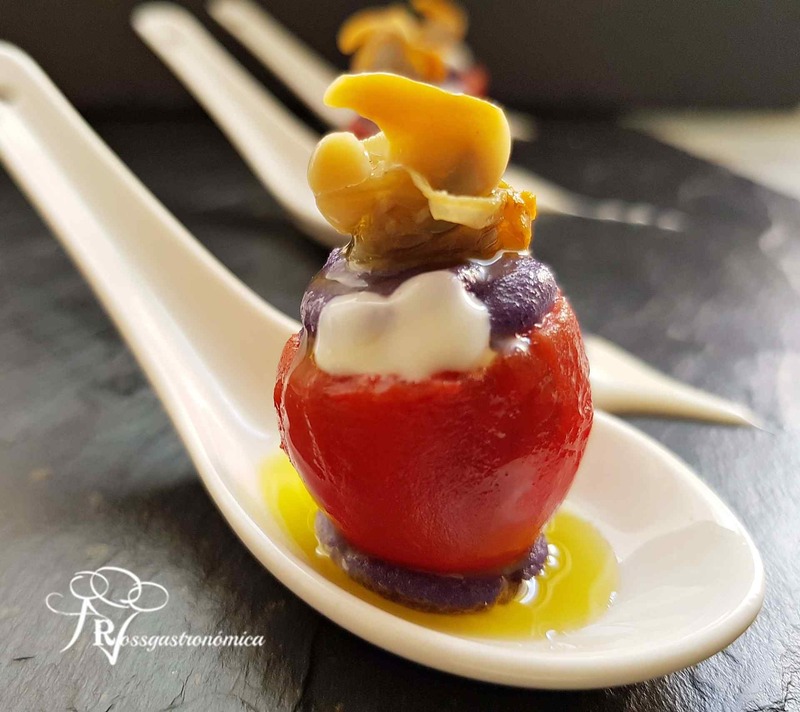 Take note of the Cherry bonbons with purple parmentier and cockles that Rosalía has sent in from Rossgastronómica, because if you prepare these, success is guaranteed. A delicious snack with the seafood taste of our Rías Gallegas cockles. Make a small cross-shaped cut at the bottom of each cherry tomato. Boil water and blanch the cherry tomatoes for 30 seconds. Meanwhile, prepare a container with water and ice. Right after the cherry tomatoes have been blanched for 30 seconds, place them in the freezing water. This way we interrupt the cooking process and the skin will come off easily. Remove the skin from the tomatoes, slice off the top and empty them with the aid of a teaspoon. Place them facing down on kitchen paper. Store them in the refrigerator. Boil the purple potatoes with their skin. When they are soft, remove them from the water and leave them to cool. Once called, remove the skin, chop them and place them in the blender bowl. Open the tin of natural Serrats cockles and empty them over a colander, on top of a container for the liquid. Set aside the liquid and the cockles separately. Pour half of the liquid from the cockles in the bowl where the boiled potatoes are. Add salt and blend until achieving a fine paste without lumps. Put the mashed purple potato (parmentier) in a pastry bag. Set aside until you prepare the bonbons. Place a cockle inside each cherry tomato. Fill up with the purple potato parmentier. Place another cockle on top. Add two dots of mayonnaise on each tomato. Add some drops of Extra Virgin Olive Oil on each cockle. Serve on a spoon so they are easier to consume.